Southern California meets Italy in this celebration of cycling, food, and San Diegos picturesque water front. Held in beautiful Downtown San Diego, the two-day festival features a mass-start, timed Gran Fondo with 4 route options, timed King and Queen of the Mountain competitions, The Bike & Fitness Expo with guest speakers and bike, health and fitness clinics. Challenging and inspiring routes, outstanding Campagnolo ride support, delicious food on course, followed by an Italian Feast at the Finish. Our classic 100-mile Gran Fondo Route includes the “Great Western Loop”, a San Diego favorite that cruises through East County’s backcountry. 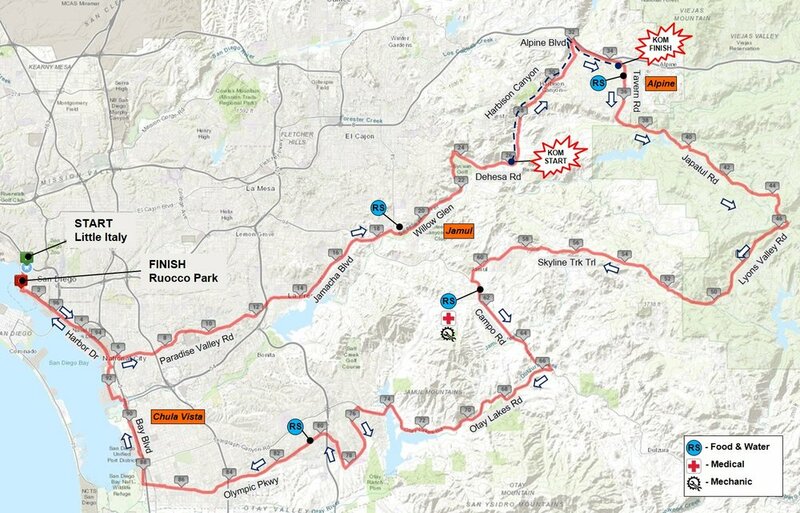 The Gran Fondo Route boasts 6,600 cumulative feet of elevation gain, timed climb on Harbison Canyon, and five well-stocked aid stations. Open to all riders 15 years of age and up. Each rider must be in sound health for the event chosen. Riders under 18 must have the signed consent of a parent or guardian. While most riders will use a road bike for the Granfondo, those riding the shorter distance Piccolo Fondo and Fun Fondo may use other types of bikes such as mountain bikes and hybrids. How was Campagnolo GranFondo San Diego?